this is my blog of the mostest awesome mmo currently available! go to www.istaria.com for more information! in istaria, there are 2 game servers (called shards) - order, the roleplaying shard, and chaos, 'normal' play shard - and a test server (my home, blight). many many moons ago, the roleplayers of order would create chat channels and write stories as they went. 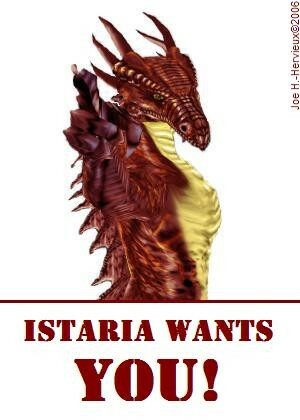 the mighty but so humble fool of istaria, sephiranoth, is an author in real life, and published stories under the short lived and long missed istaria publishing house. the gods and the fool decided to recreate those long lost days by having story time on chaos, saturday afternoons. here is the first session, from last saturday - the prologue and first chapter of the story of the lightning and the thunder, the fool and the fair. there is hope that these stories will eventually be published for a wider audience, so i will only show this session, altho i hope to be in attendance for all the storytimes. it is my hope that it will inspire you to attend a session or five for yourself, and hear the whole tale for yourself! the following screenies are in order. the actual story begins about halfway thru the second screenie. i hope you enjoy the event as much as those who attended it did. btw, on chaos, i am soknot. before we continue on, i want to keep you updated on the fine video work of the gods and players. in this 48+ minute vid, pryzm explains about dragon disks, pets, and scales. good pryzm also talks about advanced crafting (over 1 hour and 17 minutes for this vid) and the undead invasion of new trismus (about 56 and a half minutes) in these 2 vids. lastly, we have the very long (over an hour and 45 minutes) - but worth it - demonstration of the creation of a baddie's territory, called 'the land of the exiled'. i hope you enjoy them, and that they inspire you to come home to see the sights first hand. back soon with more fun! so, here we are at the final part of both the fashion designer questline and the sslanis wear questline. it has been a lucrative exploration and we will end on a fun note! let's find out what happens, shall we? we found kesh in the fort, so we now need to greet it. the sslik scholar will translate the formula for you, but needs you to obtain some feathers for quills - from the giant chickens that roam the farmstead northeast of the city. now, this hunt should be soloable by the appropriate level, but there are both gruoks and chickens to deal with, so a group or a babysitter, as usual, makes things a lot easier. take your leave, temporarily, and head for the south gate. take the road out past the shrine and take the first dirt road on the left once out of town. keep following the road thru the gruoks until you start to see the giant chickens. the patrol areas of both critters overlap, so you will have to keep an eye on the gruoks while hunting your chicken feathers. not every kill will get you the needed feathers, so you will be here a while. the hunting ground stretches from the southern border to the farm up north. since you will need to kill a lot of chickens, go ahead and start killing. the boss chicken, el caliente, counts for the quest, and respawns often, as do the regulars - and there are a lot of them, anyway, so you should have no problem with getting the needed feathers, except for patience. just don't forget to loot! to get back to sslanis the easy way, head strait thru the forest fields southwesterly. take the road back to the gate, thru the fort to the doorway across from the fountain, and into kesh's workarea. approach and greet the sslik again, and get your thanks and reward. at the end of this questline, you should have the following rewards in your inventory (unless you have disposed of them already): tokens of gratitude; a small moneybelt; animal skins, damaged and undamaged; animal bones; and lots of chicken feet. as we know, these items can be used to get more coin. thus ends our exploration of istaria's fashion designers. i hope it was fun and perhaps inspired you to take up the fashion skewls. the clothes are pretty sweet and look good on you! i have started on the new low level questline, so i hope you will join me again soon to give it a go.